The number one question I get asked about my hair is...what products do you use?? 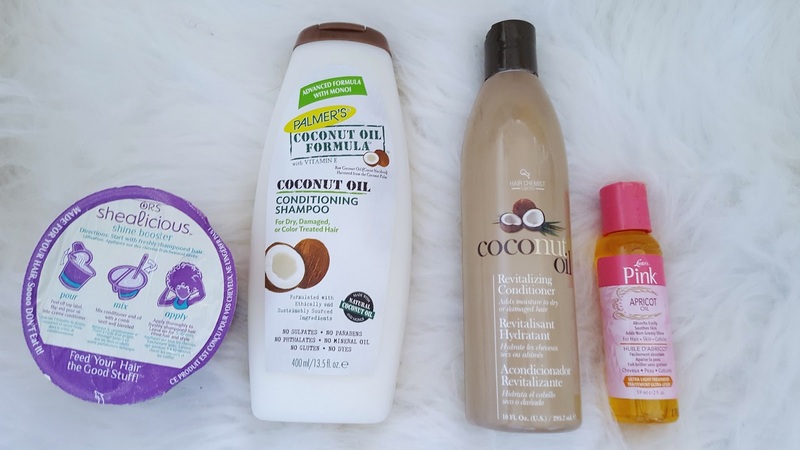 I have probably tried 80% of the natural hair products on the market. 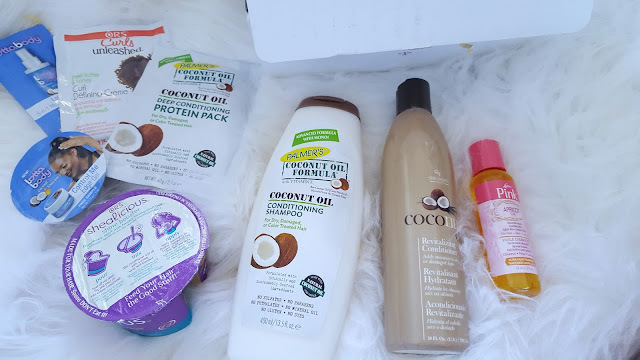 I have my favourites and the ones I can't stand, but with natural hair being the 'in thing' these days, I am open to trying new things catering to natural hair. If you are a new natural or constantly seeking for hair products, it can be hella expensive. Like who has all the coins for some of these products? £25 for a shampoo...£14.99 for an oil...erm nope not me! 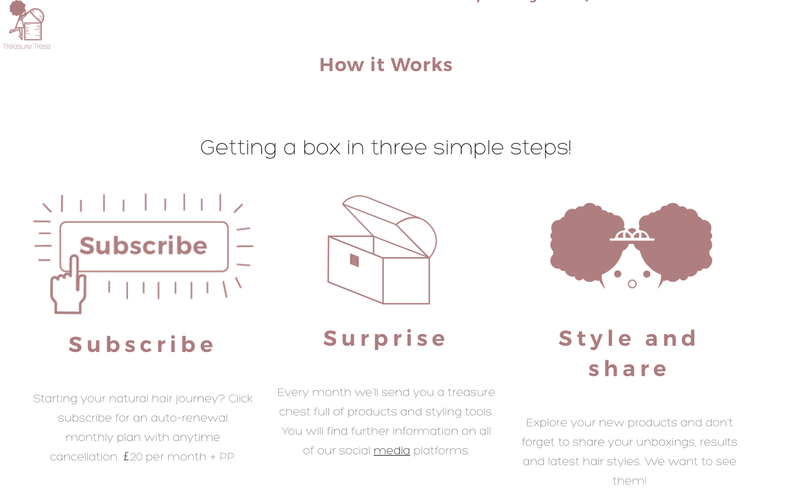 One of ways of trying out new products and saving some coins, is subscription boxes. 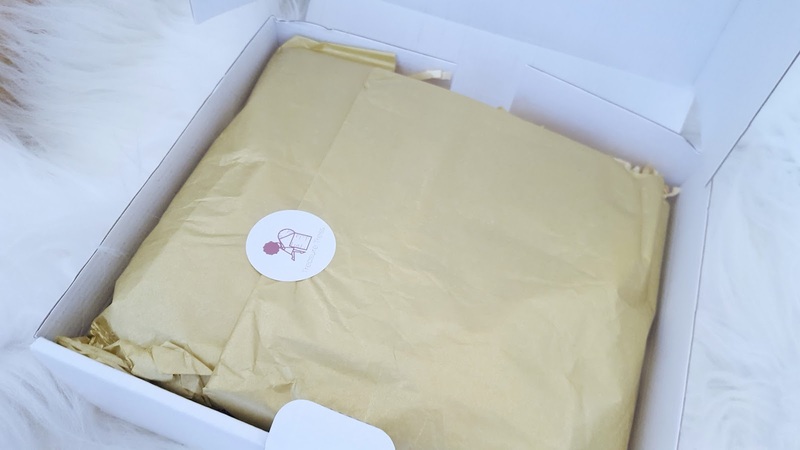 We all know trying to get access to products in our local beauty store can be challenging so subscription boxes give you the luxury of testing new products, learning more about the brand and saving some money! its all a win win situation!! I am happy to announce I am working with Treasure Tress as an affiliate!!! I previously worked with another natural hair subscription box service, which I am not longer affiliated with (want to know why click here) so I am familiar with the concept of these subscription boxes and their purpose. 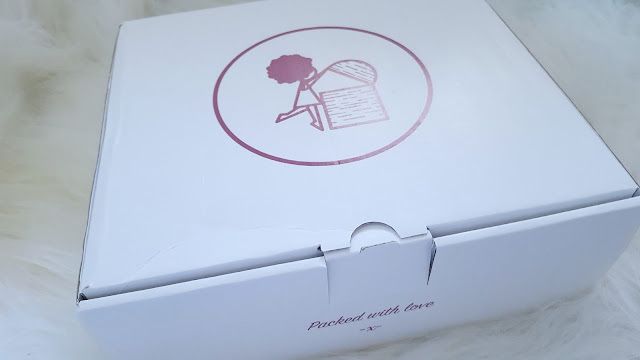 What I love about Treasure Tress is that they offer three different boxes to cater for different ages, which I think is genius! I love the clean-ness and simple design of Treasure Tress, it is very welcoming and warm, as if your friend sent you some stuff from her stash to hook your hair up because she knew you were struggling!! 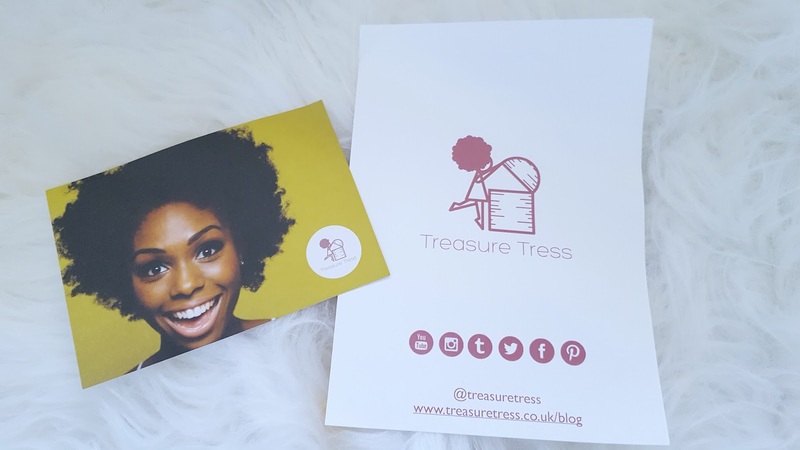 Lets get into August's Treasure Tress box. Opening it up, I was presented by some lovely gold paper and shredded paper which was hiding the goodies. This month's box is Carnival themed! shout out to my Caribbeans!!hehe! Inside the box there are 4 full sized products, 3 leaflets and 4 sachets. Now you know I am not a fan of sachets, but I understand their purpose in this box. They are there for testing, before you buy the full sized-products. If it was full of sachets, then I would be side-eyeing, but it is a balanced box. I love that the box provides information for styling with the products included. 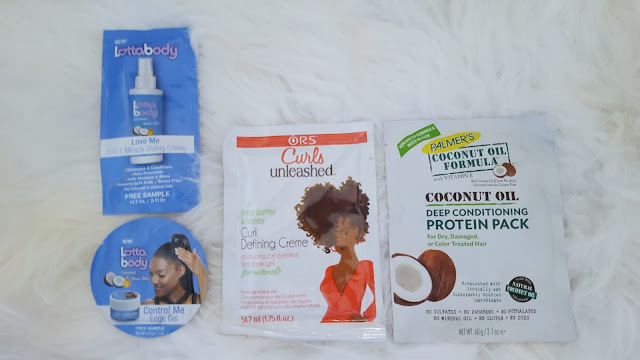 Which is great for someone new to natural hair, as it will be challenging if you have no clue where to start. It would be great if photos were also provided, as some people are more visual, but either way it is very useful. Lotta Body Love Me 5-n-1 Miracle Styling Creme & Control Me Edge Gel: I have tons of these sachets in a box in my house, but have yet to try them out. I have kinda given up on edge control gel, so I give them to my sister, and she loves them. As for the styling creme, it is something I would use to do my braid-outs. ORS Curls Unleashed Curl Defining Creme: I also have tubs and tubs of this product stashed in my bathroom, I did a review of it years ago when it first launched and it wasn't one of my favs, purely because of the smell, but it is a good product. I use it to style my sister's wash n go and have used it in the past on my hair to do braid outs. Palmers Coconut Oil Formula Deep Conditioning Protein Pack: I remember using this yearrrsss ago, probably the first protein product I used. I would recommend this to those of you who are new to protein treatments as it is quite light. I use more intense protein treatments because I have colour-treated hair. Definitely give this one a go! Ors Shealious Shine Booster Shea Butter Conditioning Hair Treatment: I have seen this product floating around the internet and I haven't yet tried it out. It claims to help improve dull and lack lustre hair. The packaging is DIY, like a split pot yogurt where you snap one side and mix it in the yoghurt. Fun to some extends and annoying to others. Palmers Coconut Oil Formula Conditioning Shampoo: I have tried some of Palmer's hair products in the past and haven't been that impressed, but I do like to use generic brand products on my hair when using heat on my hair. This shampoo is infused with Monoi oil, which seems to the new oil craze, it also contains keratin protein and coconut oil. Hair Chemist Coconut Oil Revitalising Conditioner: I have never heard of this brand before. It looks very similar to another brand's packaging. It claims to add moisture to dry and damaged hair and add shine, control and give hair silky manageability. As this product contains silicones, I would use it on my hair when using heat, as it helps to keep the moisture in and stop reversion so quickly. Luster's Pink Apricot Oil: Good ole' Lusters, the famous pink bottle. 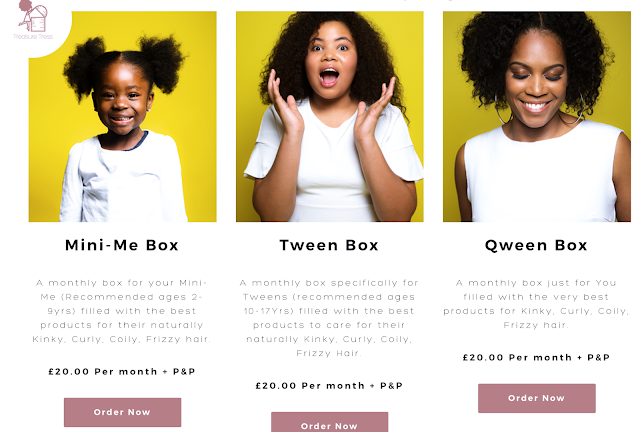 They have recently launched a natural hair line and are re-branding. I have used Apricot Oil on my hair in the past and had great results. This oil is not just for your hair and can be used on your skin too. Which is great! PLUS...the packaging and information provided. So all in all it is worth the money! 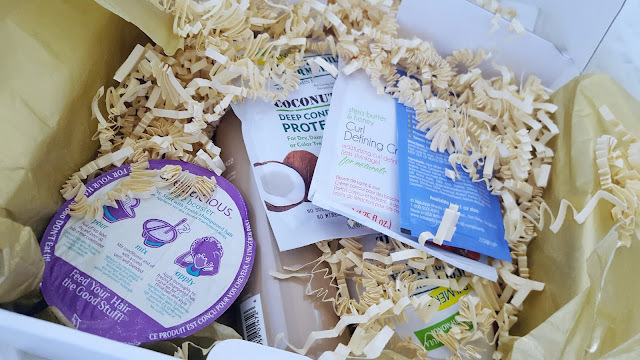 I would definitely recommend Treasure Tress to you and I can't wait to see what is in September's box! oh and of course I have to hook up for you! Use code: UKAFROLISTA10 to save 10% off your subscription. ENJOY!! !